رفیعیان, منصور, خلیلی گشنیگانی, مریم, ابوترابی, محمد مهدی. (1394). بررسی تجربی اثر سرعت برشی بر ارتعاش چتر در ‏فرایند داخل‏ تراشی. مجله صوت و ارتعاش, 4(8), 39-52. منصور رفیعیان; مریم خلیلی گشنیگانی; محمد مهدی ابوترابی. "بررسی تجربی اثر سرعت برشی بر ارتعاش چتر در ‏فرایند داخل‏ تراشی". مجله صوت و ارتعاش, 4, 8, 1394, 39-52. رفیعیان, منصور, خلیلی گشنیگانی, مریم, ابوترابی, محمد مهدی. (1394). 'بررسی تجربی اثر سرعت برشی بر ارتعاش چتر در ‏فرایند داخل‏ تراشی', مجله صوت و ارتعاش, 4(8), pp. 39-52. رفیعیان, منصور, خلیلی گشنیگانی, مریم, ابوترابی, محمد مهدی. بررسی تجربی اثر سرعت برشی بر ارتعاش چتر در ‏فرایند داخل‏ تراشی. مجله صوت و ارتعاش, 1394; 4(8): 39-52. وقتی ماشین‏کاری قطعات مکانیکی با دقت بالا انجام می‏شود، باید از ارتعاشات خودتحریک چتـر کاملاً اجتناب شود؛ زیرا این نوع حرکت ارتعاشی باعث بی‏ کیفیتی سطح و خطاهای ابعادی غیرقابل قبول می‏شود. به‌طور معمول پدیدة ارتعاش ناپایدار زمانی به‏وجود می‏آید که به‌طور کلی سختی سیستم ماشین‏کاری کم باشد. این پدیده بیشتر در فرایند داخل‏تراشی با ابزار باریک و بلند رخ می‏دهد. در این مقاله، اثر برخی از پارامترهای مؤثر بر فرایند داخل‌تراشی به‌صورت آزمایشگاهی روی یک ماشین تراش به‏ کمک شتاب‏ سنج‏ های نصب‌شده روی ابزار برش مطالعه شده است. سپس سیگنال‌های شتاب‌سنج در حوزة زمان و طیف فرکانسی آنها بررسی شده‌ است. نتایج نشان می‌دهد که سرعت برشی مهمترین پارامتری است که می‌تواند عملیات برشکاری را با محدودیت مواجه کند. Quintana, G., J. Ciurana. “Chatter in machining processes: A review.” International Journal of Machine Tools & Manufacture, Vol. 51, 2011, pp. 363-376. Wang, M., R. Fei. “Chatter suppression based on nonlinear vibration characteristic of electro rheological fluids.” International Journal of Machine Tools & Manufacture, Vol. 39, 1999, pp. 1925-1934. Wang, M., R. Fei. “On-line chatter detection and control in boring based on an electro rheological fluid.” Mechatronics, Vol. 11, 2001, pp. 779-792. Ema, S., E. Marui. “Suppression of chatter vibration of boring tools using impact dampers.” International Journal of Machine Tools & Manufacture, Vol. 40, 2000, pp. 1141-1156. Edhi, E., T. Hoshi. “Stabilization of high frequency chatter vibration in fine boring by friction damper.” Journal of the International Societies for Precision Engineering and Nanotechnology, Vol. 25, 2001, pp. 224-234. Mei, C. “Active regenerative chatter suppression during boring manufacturing process.” Robotics and Computer-Integrated Manufacturing, Vol. 21, 2005, pp. 153-158. Moradi, H., F. Bakhtiari-Nejad, M. R. Movahhedy. “Tuneable vibration absorber design to suppress vibrations: An application in boring manufacturing process.” Journal of Sound and Vibration, Vol. 318, 2008, pp. 93-108. Sathianarayanan, D., L. Karunamoorthy, J. Srinivasan, G. S. Kandasami, K. Palanikumar. “Chatter suppression in boring operation using magnetorheological fluid damper.” Materials and Manufacturing Processes, Vol. 23, 2008, pp.329-335. Migue´lez, M. H., L. Rubio, J. A. Loya, J. Ferna´ndez-Sa´ez. “Improvement of chatter stability in boring operations with passive vibration absorbers.” International Journal of Mechanical Sciences, Vol. 52, 2010, pp. 1376-1384. L. Rubio, J. A. Loya, M. H. Miguélez, J. Fernández-Sáez. “Optimization of passive vibration absorbers to reduce chatter in boring.” Mechanical Systems and Signal Processing, Vol. 41, 2013, pp. 691-704. Yussefian, N .Z., B. Moetakef-Imani, H. El-Mounayri. “The prediction of cutting force for boring process.” International Journal of Machine Tools & Manufacture, Vol. 48, 2008, pp. 1387-1394. Moetakef-Imani, B., N. Z. Yussefian. “Dynamic simulation of boring process.” International Journal of Machine Tools & Manufacture, Vol. 49, 2009, pp. 1096-1103. Sortino, M., G. Totis, F. Prosperi. “Development of a practical model for selection of stable tooling system configurations in internal turning.” International Journal of Machine Tools & Manufacture, Vol. 61, 2012, pp. 58-70. Sortino, M., G. Totis, F. Prosperi. “Modeling the dynamic properties of conventional and high-damping boring bars.” Mechanical Systems and Signal Processing, Vol. 34, 2013, pp. 340-352. Totis, G., M. Sortino. “Robust analysis of stability in internal turning.” Procedia Engineering, Vol. 69, 2014, pp. 1306-1315. Atabey, F., I. Lazoglu, Y. Altintas. “Mechanics of boring processes-Part I.” International Journal of Machine Tools & Manufacture, Vol. 43, 2003, pp. 463-476. Atabey, F., I. Lazoglu, Y. Altintas. “Mechanics of boring processes-Part II-multi-insert boring heads.” International Journal of Machine Tools & Manufacture, Vol. 43, 2003, pp. 477-484. Lazoglu, I., F. Atabey, Y. Altintas. “Dynamics of boring processes: Part III-time domain modeling.” International Journal of Machine Tools & Manufacture, Vol. 42, 2002, pp. 1567-1576. Siddhpura, M., R. Paurobally. “A review of chatter vibration research in turning.” International Journal of Machine Tools & Manufacture, Vol. 61, 2012, pp. 27-47. 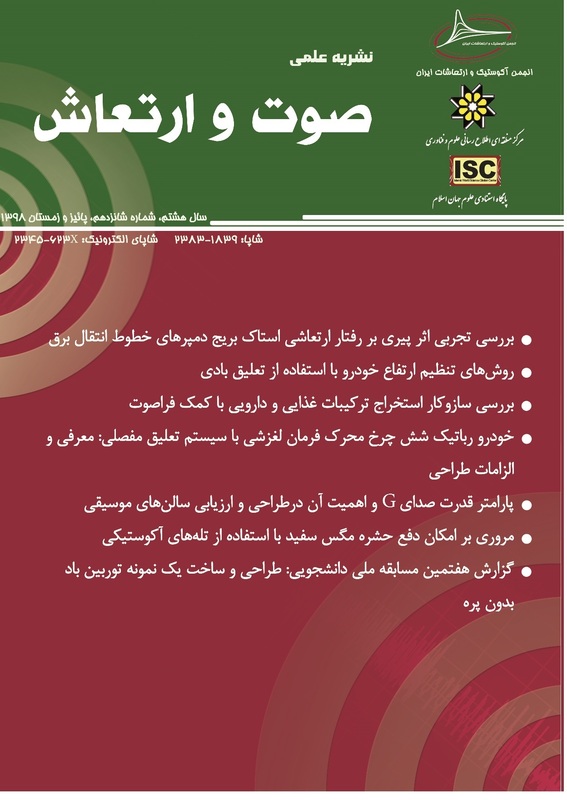 Shaeri, M. H., M. T. Salehi, S. H. Seyyedein, M. R. Abutalebi, J. K. Park. “Microstructure and mechanical properties of Al-7075 alloy processed by equal channel angular pressing combined with aging treatment.” Materials and Design, Vol.57, 2014, pp. 250-257.